Venturi is a potent solution combining several strong solvents for the total cleaning of all vehicle carburetor and fuel injection systems. Areas of use Venturi is specifically aimed at the cleaning and removal of oil, grease, carbon and other accumulated deposits from vehicle carburetors and fuel injection systems in situ. Venturi is ideally suited to garages, vehicle repair workshops, transport companies, fork truck companies, engine tuning bays and fleet hire workshops. Benefits Venturi may be applied via the air intake whilst carburetor is in situ and is highly effective on grease, oil, carbon and tar that may build up on fuel systems. Venturi contains a visual marker dye and instantly dissolves contaminants internally and externally giving increased efficiency from fuel systems. 5 Litre Container NSF registered Oven & Plant Carbon Remover suitable for the removal of baked on grease and carbon from metal surfaces. Clings to vertical surfaces. Easily applied using trigger spray. Effective ready to use formula. Effective on both cold and warm ovens. No choking fumes. Highly concentrated for lowest overall environmental impact. Viscous formulation allows product to cling to vertical surfaces ensuring better contact time Ready to use formulation Highly effective removal of carbon, and grease deposits Ideal for use on ovens, grills etc . As an oven cleaner and for the fast removal of blood and other baked on food products. Used in kitchens, bakeries, food plant and other areas of food product build up. Directions Always wear impervious gloves. Oven Cleaner will work best when the oven is warm. Switch oven off before application. Apply an even layer of oven cleaner by either trigger spray, cloth or by sponge to the oven interior, leave to act according to the table below. Cold oven Warm oven Light grease 10 mins 5 mins Heavy grease 30 mins 15 mins Baked on grease 2 hours 1 hour. After appropriate contact time wipe off using a cloth and clean water. For very stubborn deposits a second application may be required. N.B. Do not use on aluminium or galvanized metal. Warning: This product is highly CAUSTIC. Always wear protective clothing, gloves and face/eye protection during use. DO NOT APPLY TO HOT SURFACES. If you have any queries then please contact us. Converts odours into neutral smells. Excellent for pet odour. 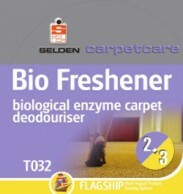 Penetrates underneath the surface of the carpet to remove the source of odours from carpet backing and underlay. Replaces household bacteria that produce ammonia as a waste product. Bio-degrades urine into C02 and water. Lemon perfume for instant reodorisation before the bacteria start working. Totally out performs all detergent alternatives. Directions:: Spray directly onto the area affected. Product does not foam, allow the liquid to penetrate. Ensure the treated area is wet though not saturated. Leave to dry out, the area will be cleaned during a period of around 36 hours. Do not use in conjunction with antibacterial products. 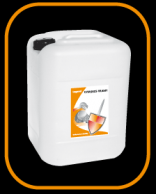 Infix is a heavy duty spray adhesive incorporating a variable spray pattern nozzle suitable for a wide range of demanding uses. Areas of use Infix is compatible with a variety of materials and as such finds applications in the furniture, flooring, carpet, automotive, upholstery, shopfitting and woodworking trades as well as being extremely useful for all general maintenance operations in factories, colleges, universities and hospitals etc. Benefits Infix gives a varied spray pattern via a special applicator nozzle and is suitable to use on most plastics, fabrics, wood, metal, ceramics and is even safe on all foam including foam backed carpets. N.B: infix should not be used on plasticised pvc. Suitable for use for pre-spraying and spot cleaning of heavily soiled areas. Rapid dirt removal. Compatible with all makes of hot/cold water extraction machines. Low foam for ease of pick up. Pleasantly perfumed. No unpleasant after odour. 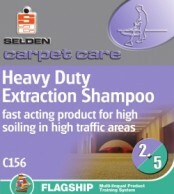 Fast acting for high soiling in heavy traffic areas. Developed to rapidly cut through grease and heavy soiling, able to suspend typical winter soiling for easy machine extraction. directions	N.B. Test a small inconspicuous area of the carpet for colour fastness before commencing cleaning. ** Dilute 1 part to 40 parts hot/cold water (to machine specification). Ensure detergent spray is not blocked and suction recovery is functioning correctly. Spray and pick up in accordance with machine manufacturers recommendations. Ensure that as much liquid as possible is extracted from the carpet to speed up drying. For general pre-spraying dilute 1 part to 10 parts water. For heavily soiled areas pre-spray with 1 part to 4 parts warm water then use extraction cleaner as normal. 5 litre Container FOR PROFESSIONAL USE ONLY If you have any queries then please contact us. Moly Disulphide Grease. Will not throw off!. / .Penetrates linkage and gears. Thickens to cling to Wire Rope and linkages. Ideal for Auto workshops, Greenkeepers workshops / Chain Saws / Quarries / Fork Lifts / etc........ Reduces friction and metal erosion by coating surfaces. / Water resistant / prevents rusting. / Description A NSF registered food grade chain spray and is a highly tenacious, anti-fling lubricant, designed for chain and drive systems in food plants. • All angle valve means the lubricant can be sprayed when inverted. • Non Toxic and water resistant. • Protects from corrosion. Tenacious anti-fling formulation Ideal for rotating and moving parts Non-toxic Chemical and water resistant Long lasting Good penetrating properties Lubricates chains, pins and bushes Special 'all angle valve' allows the can to operate when held in any direction, even upside down Safe for use where incidental contact with food may occur Chlorofluorocarbon (CFC) free aerosol Economical in use Easily directed spray 400ml aerosol Directions Shake well, spray from a distance of 15-25cm using the extension tube for difficult to reach areas. A thin film is sufficient for most applications. All angle valve means lubricant can be sprayed inverted. A NSF registered food-grade chain spray and is a highly tenacious, anti-fling lubricant, designed for chain and drive systems in food plants. • All angle valve means the lubricant can be sprayed when inverted. • Non Toxic and water resistant. •Protects from corrosion. 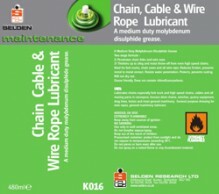 Tenacious anti-fling formulation Ideal for rotating and moving parts Non-toxic Chemical and water resistant Long lasting Good penetrating properties Lubricates chains, pins and bushes Special 'all angle valve' allows the can to operate when held in any direction, even upside down. Safe for use where incidental contact with food may occur Chlorofluorocarbon (CFC) free aerosol Economical in use Easily directed spray 400ml aerosol Directions Shake well, spray from a distance of 15-25cm using the extension tube for difficult to reach areas. A thin film is sufficient for most applications. All angle valve means lubricant can be sprayed inverted. If you have any queries then please contact us. PDCB Free Channel Blocks Lemon. Av.150 blocks 20g each. 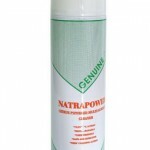 Neutralises unpleasant odours from urinals / TIP: (Suspend from stocking to give a long lasting fragrance in rooms) completely water soluble, so will not block drains. SAFE IN USE. Also; Upon Request ; BIOBLOCKS Enzyme clear pipework blocks. If you have any queries then please contact us.